A couple weeks ago, I reviewed six issues of Miriam Libicki's Jobnik. She contacted me shortly afterwards and noted that she's got a graphic novel version of the story coming out, with a fair amount of overhauling done to it. She was kind enough to send me a "Preview Edition" and I have to say that all of the criticisms I had of the original books have been addressed, making this for a very handsome final package. The book still has the same, powerful story, but it's more elegantly told. She didn't update things because they were my criticisms, of course! I think Libicki saw the same things I did and, when she choose to collect the work in a graphic novel form, opted for artistic integrity and completely redrew the first three issues in their entirety, matching the illustrative style she began settling into with issue #4. She also changed the pacing of the second issue to make for a smoother read. Although the Preview Edition I have still uses computer lettering for the last half, Libicki's noted that she's gone back and hand-lettered it which, judging by her re-work on the first half, will flow much better with the art. I have to give Libicki a lot of credit. Many artists, when their older work gets re-released, are content to let it stand on it's own. George Lucas was able to overhaul Star Wars because he's got an insane amount of money and could pay hundreds, if not thousands, of people re-do effects and such. Libicki doesn't have that financial luxury -- if she wants to go back and improve upon her original work, the only thing she's got to work with is her own integrity and artistic merit. Offhand, the only other comic artist I can think of that's done something like that is when Neal Adams, working for free, went back to recolor his Batman stories for those hardcover collections from a couple years ago. That shows a lot of dedication and commitment to your work to be willing to do that, and I think it's that much more powerful because of it. She's definitely someone I'm going to be keeping my eye on, as I expect she's going to gain more notoriety and critical acclaim with her work. I understand that she will be at Comic Con International -- booth M5 in the Small Press Pavilion. 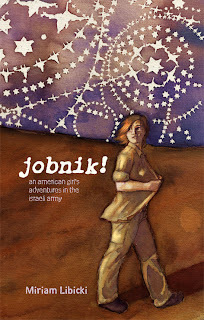 She'll have copies of her Jobnik graphic novel available, although she made a post on her site yesterday that it sounds like the timing will be a bit tight getting them back from the printer before she leaves for San Diego. (Has anyone ever made it to CCI without having this problem? It almost sounds like some sort of printer conspiracy!) If you're able to attend the show, I highly recommend swinging by Libicki's booth and picking up a copy of her work. Do me a favor, too, and chat with her for a bit -- I didn't have the pleasure of much more than a brief "hello" when I saw her in Chicago, and I have to admit to some regret because of that. what is there motogp comic?